Sensing a special relationship between Arvo Pärt and J.S. 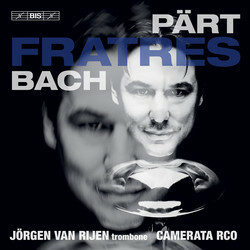 Bach, Jörgen van Rijen on his first recording for BIS Records brings together music by the two composers. It’s a relationship which has several aspects. First, Pärt has readily admitted to his love for the work of Bach, referring to it in titles such as Collage über BACH, but also by using the motif BACH (B flat-A-C-B). In addition, both composers share a fascination for religion, while at the same time composing music that is almost mathematically constructed, possessing an underlying order that forms the basis of its timelessness. In collaboration with the composer, van Rijen has adapted four works by Pärt for the trombone, including the celebrated piece Fratres, which exists in numerous versions, as well as the two religiously themed An den Wassern zu Babel … and Vater unser. Pärt’s open-minded attitude to adaptations of his works is also something he has in common with Bach, who regularly reused his own compositions, rearranging them for new occasions. Bach also ‘borrowed’ from other composers, and the three concertos heard here are all arrangements for solo harpsichord of works by Italian composers, which van Rijen in his turn has arranged for trombone and strings. Principal trombonist of the Royal Concertgebouw Orchestra, Jörgen van Rijen is here supported by his colleagues in Camerata RCO.